All winter wreaths and decorations not placed in urns at the cemetery need to be removed before May 1st for spring clean-up. Any items left after May 1st will be discarded. Posted 12:55pm 2/25/19; we have cancelled the 254th Special Meeting of the City Commission for today at 3:30pm due to road conditions as the MML Representative is coming from the other side of the State. Today’s meeting was to discuss the City Manager search. We will post here once the meeting has been rescheduled. We apologize for any inconvenience. The Scottville City Commission will hold the 254th Special Commission Meeting on Monday, February 25th at 3:30pm to on the City Manager Search. Kathie Grinzinger from the MML will be here to lead the discussion. The meeting is open to the public. The Scottville City Commission will hold the 253rd Special Meeting on Tuesday, February 12th at 3:00pm at City Hall for the purpose of a Proposal from the Michigan Municipal League on a City Manager Search. The meeting is open to the public. We would like to thank Great Lakes Energy for providing us with a People’s Fund Grant for the purchase of two AED’s, one will be kept at City Hall, the second will be in our police car for emergencies. Our hope is to never have to use these, however, in the event they are needed we now have them to help save a life. We encourage all customers of Great Lakes Energy to “Round Up” their utility bills as they make those funds available to non-profits and municipalities for much needed projects though their People’s Fund. Many residents will be receiving a survey regarding possible Cross Connections in the Water System. This survey is being conducted by Mead & Hunt under the direction of the Clean Water Act and the DEQ. We just want our residents to know that this is an important survey and if contacted you should complete it. Call City Hall with questions. We would like to remind all City of Scottville Registered Voters that the polling place has changed to the Scottville Senior Center. The November General Election will be held on Tuesday, November 6th. Polls will be open from 7am – 8pm that day. Representative Curt VanderWall holds monthly Coffee Hours at City Hall. Please check our Facebook page for dates and times. Fundraising for our Sculpture Project is ongoing. Donations can be made to the Community Foundation for Mason County an please note Scottville Sculpture on the memo line. Your donations are tax deductible. For more information contact the Community Foundation or our office. Please take note that according to Ordinance # 86-2, parking shall be prohibited on any street, in any alley or in any City parking lot during the hours of 2:00 a.m. and 7:00 a.m. from November 1 to April 1 to allow for snow removal. For anyone wanting to get rid of large items for trash days you may purchase a tag at City Hall for $15. 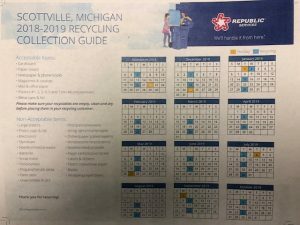 On the first Tuesday of every month you can dispose of one large item for free, so the tags can be used for additional items or on the other Tuesday trash days during the month. Starting Tuesday, September 5th City Hall will be open Monday – Friday 8am – 5pm.